Canary Mission is a secretive but clearly non-academic political organization that uses its website to engage in defamatory attacks against college students who advocate for Palestinian rights, against student and other organizations engaged with this issue, and against faculty who teach, or speak publicly, about the Israeli-Palestinian conflict. Canary Mission’s tactics threaten students’ right to pursue an education without harassment as well as the employment prospects of those whom the website targets by name, including undergraduate and graduate students but also untenured and contract faculty. Its campaign of vilification should alarm educators who value academic freedom and free speech rights in their classrooms and on their campuses, along with deans and other university leaders whose job it is to ensure the safety and well-being of their students and to help them secure decent jobs after graduation. The Middle East Studies Association’s Committee on Academic Freedom, which strives to combat threats to and violations of academic freedom in North America as well as in the Middle East and North Africa, believes that educating U.S. college and university leaders, faculty and students about Canary Mission’s goals, methods and impact is an urgent priority. Canary Mission first appeared in the spring of 2015 with a series of online attacks on undergraduate student activists who had spoken out about the denial of Palestinians’ human rights. Though the organization’s leadership and membership are anonymous, it is clearly ideologically aligned with the far-right end of the Israeli political spectrum. Its website declares that “Canary Mission documents people and groups that promote hatred of the USA, Israel and Jews on North American college campuses.” To date, Canary Mission has posted profiles of nearly 2000 individuals (mainly undergraduate and graduate students but also professors) and organizations. It claims that “every individual and organization [in its database] has been carefully researched and sourced.” In fact, Canary Mission’s profiles are filled with falsehoods, misrepresentations and errors. Its inflammatory accusations that those it targets are guilty of anti-Semitism, support for terrorism and/or hatred of the United States are particularly dangerous in the present political climate. Despite repeated denunciations by faculty, including Jewish faculty, Canary Mission continues to broadcast its false, misleading and incendiary allegations about the students, faculty and organizations it targets. What are the Goals of Canary Mission? Canary Mission’s avowed goal of combatting anti-Semitism and support for terrorism may seem reasonable. But in fact, those behind the website rely on very broad, vague and misleading definitions of anti-Semitism and support for terrorism in order to further their narrow political agenda. In effect, Canary Mission contends that any criticism of Israeli policy in the occupied Palestinian territories or of Zionism as a political ideology, any form of support for Palestinian human rights or for the Boycott, Divestment, Sanctions movement (BDS) as a way to secure those rights, and any criticism of U.S. policy in the Middle East are all tantamount to anti-Semitism and support for terrorism. Canary Mission does not engage in substantive or reasoned debate about issues or ideas; it targets and seeks to defame individuals and organizations whose opinions it does not like. For Canary Mission, then, unsubstantiated accusations of anti-Semitism and support for terrorism are a way to discredit and marginalize anyone who disagrees with the extremist views of the people behind the website. By producing what is in effect a blacklist, reminiscent of the “Red Scare” and McCarthyism, Canary Mission seeks to silence free and open campus discussion of, and teaching about, the Israeli-Palestinian conflict. It hopes to achieve this by threatening or damaging the careers of outspoken students and faculty, and by striking fear into the hearts of vulnerable students – especially Muslims, people of Middle Eastern origin and people of color – so as to dissuade them, and others, from advocating publicly on matters of social and racial justice. Canary Mission poses a particular threat to the future job prospects of today’s college students; indeed, it openly proclaims that it seeks to prevent the employment of former students it defines as “radicals.” When an employer Googles a prospective employee targeted by Canary Mission, the first thing they are likely to find are false and defamatory accusations about that person on Canary Mission’s website. Few employers will be willing to hire someone publicly accused of anti-Semitism or support for terrorism or “anti-Americanism,” or to take the time and trouble to investigate further. Moreover, the civil rights group Palestine Legal has reported that numerous students have been questioned by employers and graduate schools about their Canary Mission profiles. Is the information on Canary Mission accurate? Canary Mission’s profiles are replete with misinformation, omissions, quotations taken out of context and allegations based on guilt by association. While Canary Mission claims that it is willing to correct factual errors, there is little evidence that it has responded to complaints by those it targets, or actually removed or corrected the many false allegations and misstatements that appear on its website. Its victims have few avenues for remedy, given the difficulty, time, and financial and emotional expense of pursuing defamation suits in the American legal system, the anonymity of the website, and the fact that Canary Mission’s servers seem to be located in Israel. How does Canary Mission attack its targets? Canary Mission’s mode of attack generally involves three distinct dimensions. The website displays profiles on individual students and faculty, and on organizations, that feature personal information, quotes, photos, videos, institutional affiliations, and links to friends and colleagues. The material in each profile is framed so as to make the individual or organization appear monstrous, guilty of raving anti-Semitism and/or support for terrorism. Many individuals and organizations may, in addition, be subjected to Twitter trolling campaigns, linked back to Canary Mission; this typically unleashes a wave of denunciations from (mostly anonymous) Twitter and email accounts. Finally, Canary Mission continues to retweet its attacks, often dozens of times during the course of a single day. This set of tactics is inexpensive and effective: victims are never able to confront their accusers, who hide behind many layers of electronic cloaking. On February 26, 2018, Twitter suspended Canary Mission’s account but it was restored just two days later. No reasons were given for either action, but Canary Mission has clearly violated Twitter’s rules of conduct on many occasions. How does Canary Mission harm people? As noted above, many of the primary targets of Canary Mission belong to some of the most vulnerable groups on our campuses: people of color, people of Arab and/or Muslim origin or background, and immigrants. But regardless of race, religion or immigration status, being subjected to hateful slander and public defamation do immediate harm to one’s sense of safety and well-being. It can make strong, connected people feel weak and isolated, and it can compel vulnerable individuals to censor or silence themselves rather than speak their conscience. And of course, Canary Mission’s attacks may inflict long-term damage on undergraduate students when they enter the job market. Each attack – no matter how false or outrageous – leaves a trace on the Internet for potential employers to find. Even if the damage is difficult to calculate, it is not hard to imagine. In some ways, no. Since the 1980s, pro-Israel advocacy groups have sought to influence how the Israeli-Palestinian conflict is taught and discussed on campuses, and to stifle student activism in support of Palestinian rights. Over the years they have launched a series of high-profile, defamatory attacks on educators and researchers in the field on such sites as: Masada 2000 (“The Self-Hating, Israel-Threatening List”); CAMERA; Honest Reporting; Free Middle East; Middle East Forum; Campus Watch; Jihad Watch; David Horowitz Freedom Center; The David Project; StandWithUs; and The AMCHA Initiative. In 2011, the Center for American Progress published a comprehensive report on the links between such organizations and the rise of Islamophobia in the United States. More recently, the David Horowitz Freedom Center (which in choosing its targets seems to rely on Canary Mission) has put up posters at a number of university campuses depicting faculty and students as terrorists or supporters of terrorism; in some (but not all) instances, university leadership has responded quickly and effectively to such threats to the safety and well-being of their communities. What is new and different about Canary Mission is that the primary targets of its campaign are mainly students rather than professors, and that those perpetrating its work of defamation and character assassination remain completely anonymous. If you or someone you know has been attacked, there are organizations – like AAUP and Palestine Legal – that have developed valuable resources to help you understand your rights and what recourse you may have. But it is imperative that college and university administrators step up and take the lead in responding to this threat to their students and their educational communities. They do not need to take a position on the Israeli-Palestinian conflict; rather, deans and other college administrators need to understand what Canary Mission is and act with due diligence to support students and faculty under attack from outside the college or university community. We urge college and university leaders and administrators to educate themselves about Canary Mission and its record of subjecting students and faculty to vicious and underhanded attacks, because such attacks threaten the well-being of students and faculty, the integrity of the college community and the principles of academic freedom. We call on them to join the AAUP and other organizations in condemning such attacks, defend the campus targets of Canary Mission’s intimidation, and publicly support the free speech rights of students and student organizations, including those who advocate for Palestinian rights. Finally, colleges and universities must develop effective ways to support affected students and faculty through online reputation management, identifying online trolls, and alerting social media platforms when their services are used to defame people or attack academic freedom and free speech. 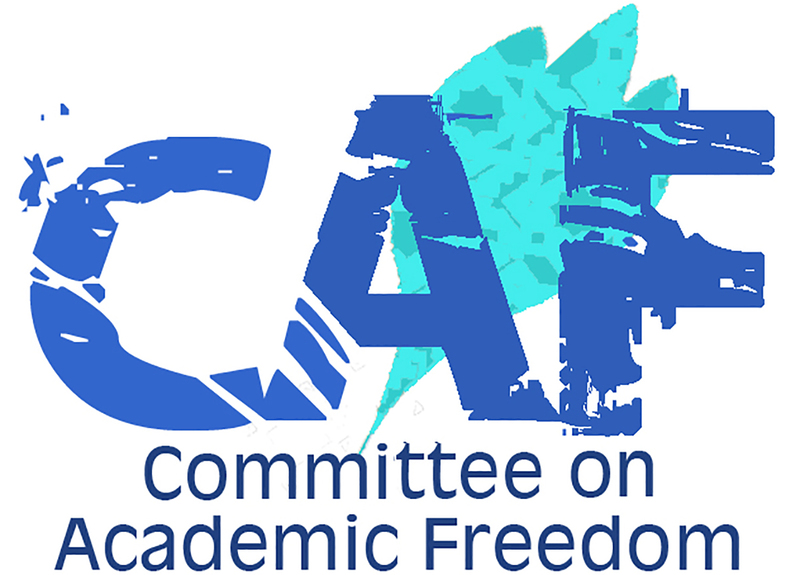 MESA’s Committee on Academic Freedom (CAF) monitors and combats threats to and violations of academic freedom in the Middle East and North Africa and in North America. Such threats and violations include governmental interference with the right of scholars to conduct research, publish their findings, teach as they see fit and travel to international scholarly meetings, as well as instances in which professors and academic researchers are harassed or persecuted for their peaceful professional or personal activities. CAF also combats efforts by organizations based outside of academia which seek to further their political agendas by harassing and defaming faculty and students and by trying to silence discussion and advocacy about current political issues. The Middle East Studies Association (MESA) is a non-profit learned society that brings together scholars, educators and those interested in the study of the region from all over the world. From its inception in 1966 with 51 founding members, MESA has increased its membership to 2,700 individuals and serves as an umbrella organization for nearly sixty institutional members and thirty-nine affiliated organizations.